A native of Indiana now living in Missouri, Jeff Maddox is a wildlife ecologist with over 25 year's experience. Jeff also teaches Argentine Tango at Step by Step Dance Studio in Springfield, Missouri. More information on classes, local tango events and schedules can be found on Facebook @ Argentine Tango Springfield, MO. Mr. Maupin is an avid outdoorsman and lives on a small rural farm in SW Missouri that focuses on sustainable living practices. 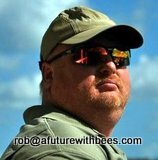 He has been in beekeeping for 6 years and has 4 apiaries of bees. His family has owned and operated this location for over 41 years and previously while growing up, his parents had honey bees on the property. Rob has over 20 years of high technology experience, including over 10 years in executive management positions. Currently he operates his own consulting firm, N+1 Technology, LLC, where he provides product and software development and management advisory services. Mr. Maupin possesses a Bachelor of Science in Finance with a Minor in Computer Information Systems from Missouri State University. Rob is active in the community as a board member and firefighter of the local Halltown Volunteer Fire Department and holds a position as secretary in the Lawrence County Shrine Club for Abou Ben Adhem shrine temple.